Caroline Springs Station opened in January, and is already being used by a fair number of people. But the station has a weakness: it’s in the middle of nowhere, a not-very-pleasant one kilometre walk from the nearest houses. Which means you pretty much have to use transport to get there: bike, bus, or car. Of course you shouldn’t have to own a car to be able to use public transport, and relying on getting passengers to the station by car is not only extraordinarily expensive, it doesn’t scale up as the station gets bigger. So given the trains are fairly infrequent most of the time, and the connecting 460 bus is fairly frequent (3 per hour on weekdays; better than most of Melbourne’s appalling middle/outer suburban buses), and the connections are critical to the usability of the station, how good did they make the connections? It’s easy enough to compare the train and bus connection times. I looked at “up” (bus to Caroline Springs, then the train to the City) and “down” (train from the City, then the bus from Caroline Springs) connection times. Of course some people might travel between the suburb and destinations further out, but I’d assume most would be travelling towards the City. Overall the connections are pretty good at peak times. Most connection times are under 10 minutes, meaning a minimum wait for changing between the trains and bus. But outside peak times it’s a real mixed bag. At lunchtime weekdays you might face a 28 minute wait for the bus. And if you arrive on the 3pm train from the City during school terms, it’s a 12 minute connection, but outside school terms (eg this week) there’s no bus until after 4pm! On weekends they’ve clearly prioritised trips to the City in the morning, and trips back in the afternoon. If you live elsewhere but want to visit friends or relatives in Caroline Springs for the day, you may end up facing a 25+ minute wait in both directions. It’s probably quicker to take the bus instead to/from Watergardens, where the trains are far more frequent and the connection times will be shorter. On Sundays, most connections to the City are terrible. In 8 out of 11 cases, you’ll be waiting more than 20 minutes for the train. Where the bus connections really fall down is in the late evening. Monday to Thursday, the last two trains (arriving Caroline Springs at the not exceptionally late times of 9:58pm and 10:47pm) have no bus connection. On Fridays, those two do, but the later arrival (11:58pm) doesn’t. On Saturdays, the last train (arriving 12:17am) has no bus connection. On Sundays, the last two trains (arriving 9:17pm and 10:37pm) have no bus connection. Oh, and if you’re up early on a weekday and hoping to catch the first train to Melbourne at 5:17am, you’ll have to find another way to get to the station; the first bus arrives an hour later. Timed connections have improved since PTV started overhauling them when South Morang station opened in 2012. Before then, there appeared to be little or no thought given to suburban bus/train connections. Of course, even good connections are only good if services are on time. If they’re not, it’s not clear what the protocol is. Trains can’t really wait, but a departing bus should be able to wait if the train is delayed — and let’s face it, with ongoing punctuality problems on V/Line, this is not unheard of. Maintaining that connection depends on the bus drivers having information about when the train is expected, and when I looked I saw no evidence that this was the case. 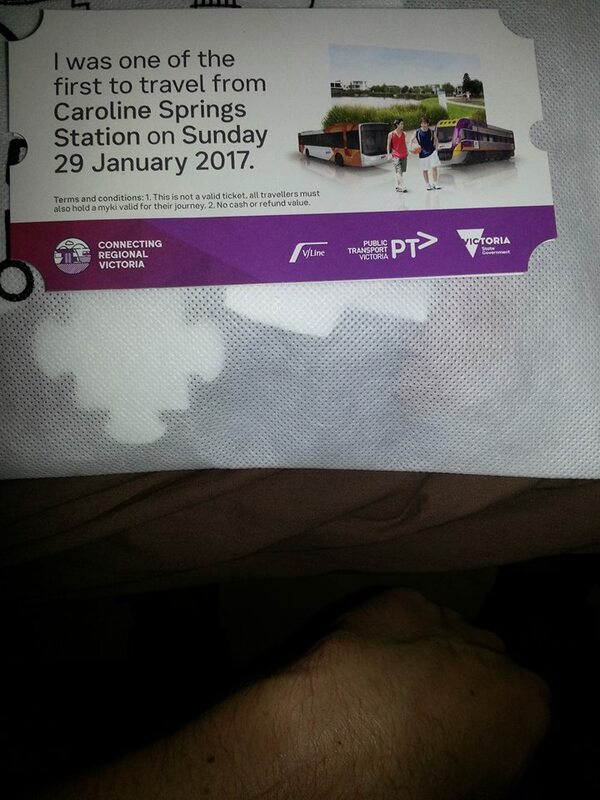 Do V/Line’s operational people notify the bus company if that happens? There’s nothing in the literature I saw that indicates any kind of guarantee of connection. This is especially important late at night. You don’t want to be missing the bus home because the train was 6 minutes late and the bus driver took off before it arrived. And if you can’t rely on the connections, will you use them? You wouldn’t build a road without connections to other roads, and nor should you run public transport that way. Connections are essential for ensuring individual routes form a network, making each route useful for far more people. Connections of course are a lot easier when one or both services are frequent. One of the benefits of the 10 minute suburban trains where they exist is that even if the bus is late, you’ll never wait very long to continue your journey. 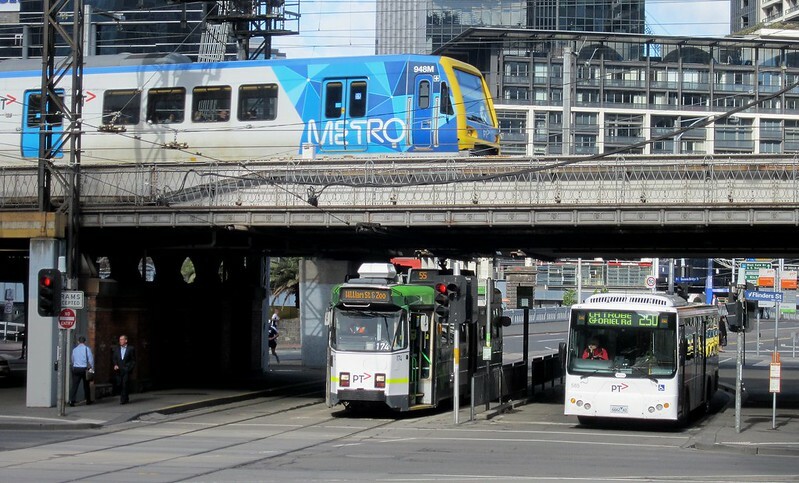 And if you’re coming off a train onto one of the tram or Smartbus services (at least when they’re running frequently) then likewise, a high level of coordination isn’t necessary — it just works regardless. But this isn’t possible everywhere, so authorities need to get better at how they plan and manage good connections around the public transport network. This is why I don’t think the SmartBus routes work. 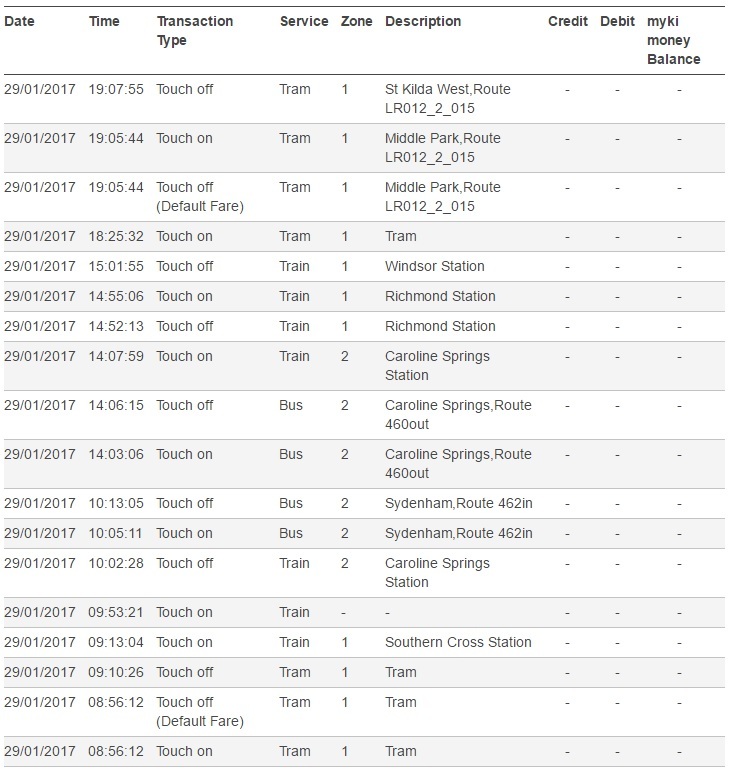 If the system is ‘smart’, ie everyone has realtime information, then the bus should wait … but that then potentially throws out your ability to meet your next train, and so on. And I have no idea what the answer is. Maybe the bus routes that terminate in central Caroline Springs could be extended to the train station, providing multiple routes (e.g. 461, 462) or divert the 456. This could, at the very least, fill gaps where the connections aren’t great. I notice that Melton has six routes going to the station there – I assume that means the connections are better. And, of course, the other thing with there only being one route to the station means that you have to live near it for the bus to be an option – meaning living within walking distance of Caroline Springs Blvd. Or else the car will win. 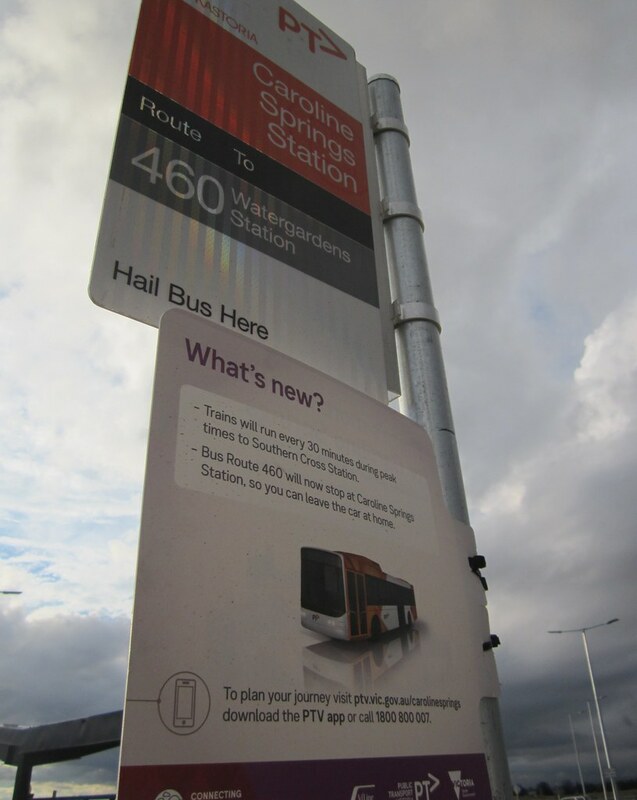 Another popular bus connecting Caroline Springs to train services is 418 which runs from St. Albans but is normally caught from Keilor Plains because that avoids a tour of St. Albans. Not sure connections are significantly better, but more frequent trains. Caroline Springs is a long (NS) skinny (EW) suburb with not always conspicuous boundaries with many smaller adjacent suburbs, so which bus you would choose to where will be strongly influenced by where you live. 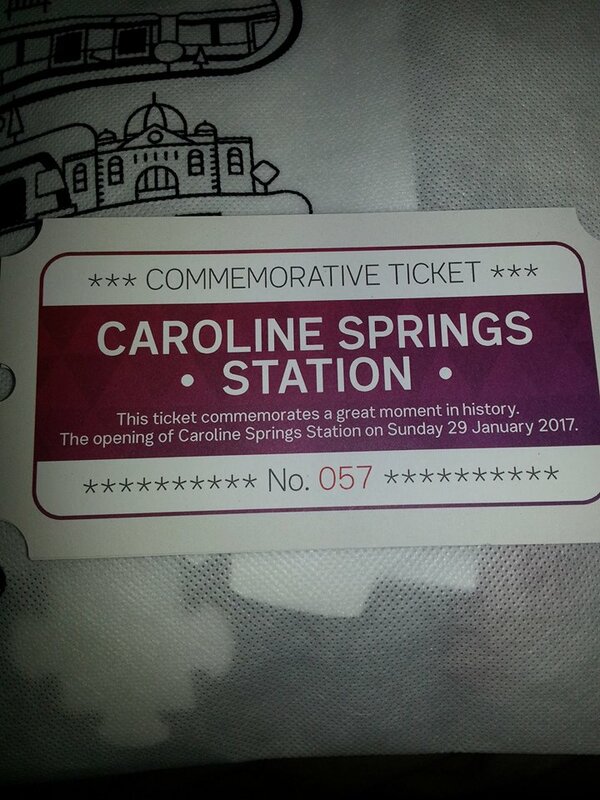 I went there with a friend on day of opening on 29 January and got the paraphernalia including the commemorative ticket (yep a certain Wesley Snipes film of the early 90’s spring to mind with a ticket number like that), as you’ll see from the below pics. On the way back, I got a second commemorative ticket along with a show bag with a cardboard model V/Locity and colouring book which I gave to a younger relative. The buses running to and from the station connected quite well for a Sunday, as per the fourth pic. Mind you, it was only a once of visit and it is the bad connections that Daniel has pointed out that are going negatively impact those who have to use the line to get to work early or come home from work/study late in the evening. I presume the 5:17am service more or less existed before the station opened and I presume mainly benefits those going into the city from other stations on the Wendouree line whose homes are either closer to those stations or have early morning connecting buses. Given that there’s a need for people elsewhere on that line to get into the city that early, one would think bus connections would factor that in. On a side note, Daniel showed his MyMyki screenshot as displaying the station as Ravenhall in an earlier blog post. Bizarrely enough, My screenshot displays the proper name, despite it being from the day of opening, so its strange that the system reverted to calling it Ravenhall beyond that date. Somewhere I’ve always found to have very good bus connections is just up the line at Melton. All through the week, buses generally meet connections to 5-10 minutes, operating at a similar frequency to the trains. There are five routes and they all depart and arrive at the same time, serving different estates across the Melton area. While it isn’t a guaranteed connection, my experience has been that buses will wait a few minutes past their scheduled departure if they notice the train hasn’t arrived yet (the arrival platform is directly adjacent to the bus interchange, probably one of the easiest connections in Melbourne). I’ve asked drivers before if it’s an official SITA policy; they’ve said it’s not, but it’s just the right thing to do for passengers. Meanwhile at Laverton, I’ve had to call a taxi because the last connecting bus at night had left a minute early combined with a train running five minutes late! as usual, I’m wondering why it’s up to a member of the public (you!) to draw attention to a dreadful situation with transport. Why didn’t a planner (who is actually paid to organise timetables) figure all this out months before the first service even ran? I think the answer is that the authorities still believe that those who use PT are second class citizens and should feel lucky there is any service at all. The authorities believe everyone has or should own a car. As with John A, I also have a few pet peeves with Laverton. There’s a variation of about 7 to 12 minutes in the timetable of the connecting bus after the arrival of the train, which would give sufficient time for the slower walkers to catch the buses after they get off the train, but this starts to be a problem when the train arrives late. Some of the bus drivers are nice enough to wait if they see stragglers coming from the station past the scheduled time, however they are under no obligation to do so and most will act following the timetable. 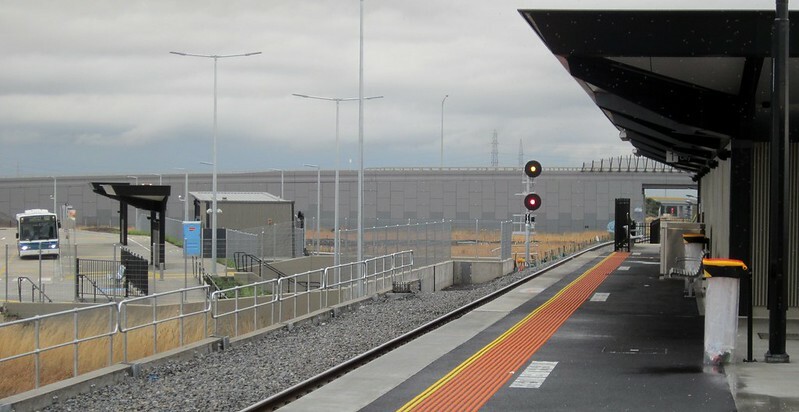 Also there are gaps in time where the trains are not served by a connecting bus, particularly the 8.40 pm Werribee train to leave Flinders Street station would not be met by a bus upon its arrival at Laverton station at 9.16. Passengers getting off at this time will have to arrange for alternative travel or wait for the 9.42 bus (which was meant to connect with the 9 pm which arrives at 9.35 at Laverton) which also appears to be the last connecting bus from Laverton station. I’m rambling on, but I wish there are more connecting buses later into the night. It would be nice if something like the late-night running 903 from Altona station can be extended to Laverton. @Adam, the easiest answer is to bump up frequencies so that it doesn’t matter if you miss a connection – this next one is, say, 5 1/2 minutes away. Basically, decide whether you want a TUAG or Pulse-based schedule, and work towards that. Kind of unbelievable that the bus route at Caroline Springs runs three times as often as the train service does (weekdays off-peak), yet it still timed so that you just miss one. The lack of off-peak trains is a bit ridiculous too. You’d think the opening of a new major station would justify stopping every off-peak train on the line there, even Ardeer gets all off-peak trains from Ballarat stopping. There needs to be more bus lines to the station too. 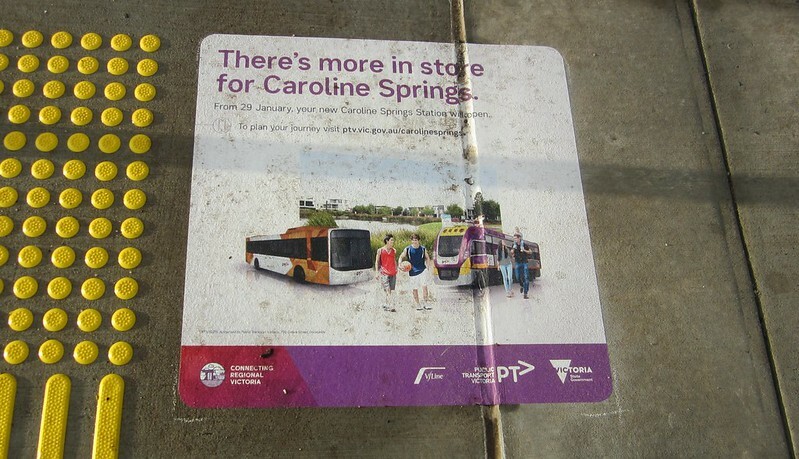 Where I live in Caroline Springs, the route 460 bus is at least 18 minutes walk away. So I drive. 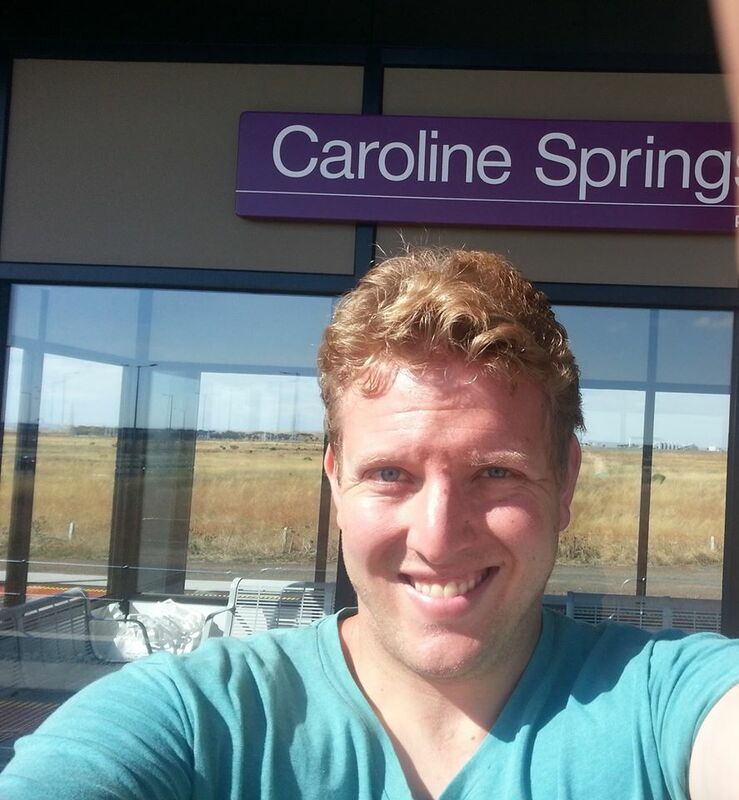 All the buses in Caroline Springs seem to be on Caroline Springs Boulevard, but houses are much further in than that.